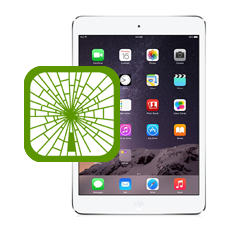 If you have damaged your black iPad Mini 2 complete screen we can help. If the touch screen glass and display underneath are damaged you will need a complete replacement iPad Mini 2 screen.Our technicians will replace the complete screen assembly on your iPad Mini 2 with a brand new digitiser glass top and a brand new LCD and restore your iPad Mini 2 screen back to full working order. If you choose not to opt for our Express Repair 24 Hour Fast Track Service our normal repair turnaround times are 3 - 5 working days. We always aim to complete repairs as fast as possible. This is an in-house Apple iPad Mini 2 repair service, when ordering this service you are required to ship your iPad into our repair centre for works to be undertaken.